Arrival - Aliens Are Here, Now What? Directed by Denis Villeneuve. Produced by Shawn Levy, Dan Levine, Aaron Ryder, and David Linde. Written by Eric Heisserer. Release date: November 11, 2016. You don't have to twist my arm in order to get me to see a new film from director Denis Villeneuve. If you deliver Incendies, Prisoners, and Sicario in the span of half a decade, I will be on board with what you do going forward, even if the result is something like Enemy. His new film, based on a short story by Ted Chiang, is about aliens landing on our planet and our attempts to communicate them and learn why they're here. Do they come in peace or is war incoming - and if it's the latter, who's going to be the one to start it? 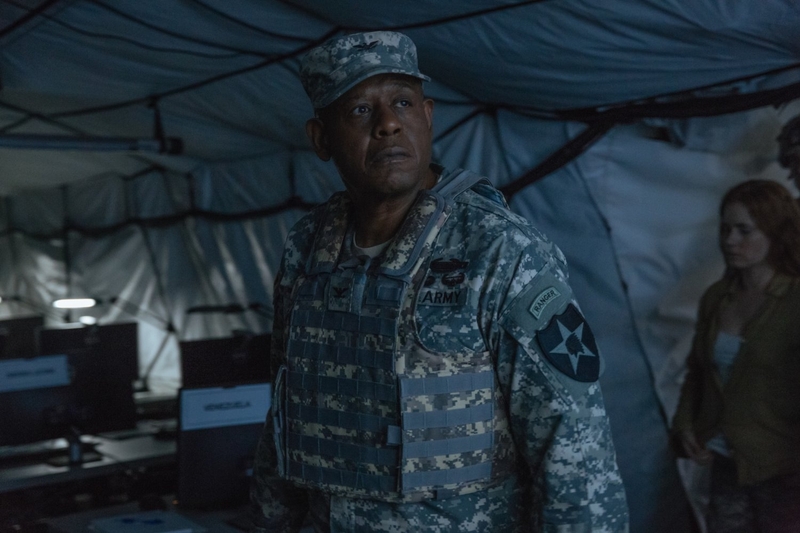 Our lead is Dr. Louise Banks (Amy Adams), a college linguistics professor who is recruited by Colonel Weber (Forest Whitaker) to try to help communicate with the aliens. 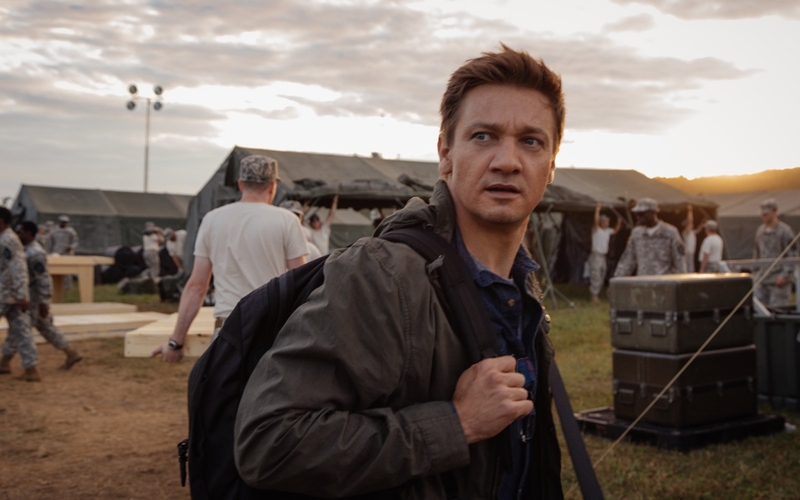 She's joined by a physicist, Ian Donnelly (Jeremy Renner), and the two of them are essentially the only ones to make any headway, both in learning the aliens' language and teaching them ours - at least, in America. There were 12 landings, and various countries are handling the problem differently. At first, most nations are in communication with the others - sharing information and progress. Soon enough, though, communications are severed. 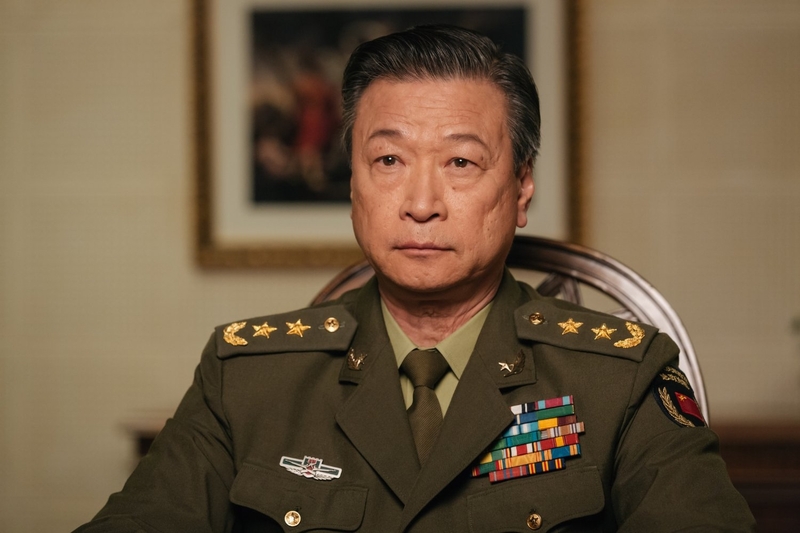 China and Russia begin to prepare for war. Time is of the essence. That's Arrival's setup, and it's a mighty good one. There's enough mystery and intrigue to keep our attention, and even all the talk about language is interesting - likely because Villeneuve is one of the best directors working at making almost anything thrilling. If anyone could make paint drying exciting, it'd probably be him. Seriously, I don't think I've ever been more interested in the ways we communicate - and I have a job writing! 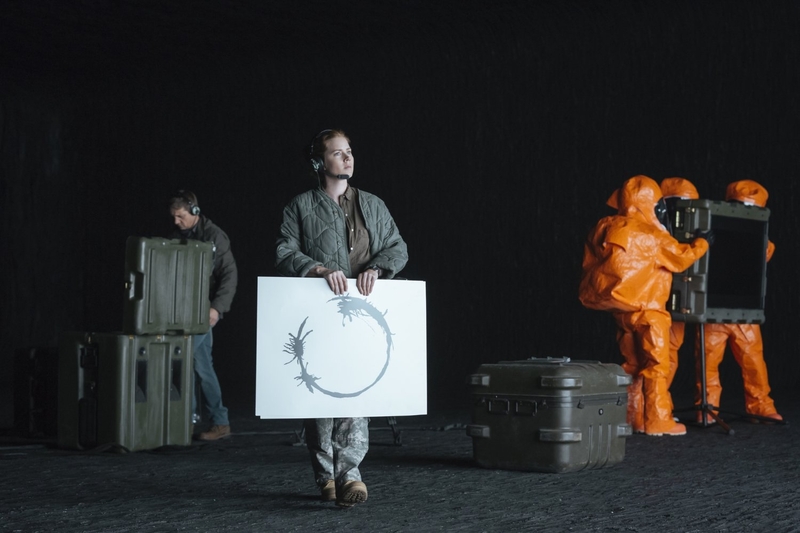 As Arrival progresses, its themes come to the surface. Its anti-xenophobia message is effective, and perhaps resonates more strongly given the current political situation. Any time a character acts irrationally or hatefully against the aliens, or attempts to go about their business in a more isolationist approach, it isn't effective. It becomes clear that the only way to find a solution here is to work together - humans with the aliens, as well as humans with other humans from around the world. Arrival is a very entertaining movie about learning to work together in order to avoid complete disaster. Or, that's how Arrival wants to go. A late-game development serves to somewhat undermine that message, not allowing it to deliver it as strongly as perhaps it should have. That development will also likely frustrate audiences, as it feels like a cheat from the filmmakers. However, it does bring both the narrative and some of the themes full circle, so I'm inclined to give it somewhat of a pass. Not a full pass - its cheating feeling and the way it undermines a lot of character development doesn't make it completely acceptable - but since it works from a narrative and thematic standpoint, and because it's so hard to fool audiences nowadays, it's hard to completely condemn the film for it. If Arrival has another flaw, it comes from the supporting cast. Amy Adams, as a flustered but headstrong protagonist, is great, and her character is mostly fine. But those around her? We don't really know a whole lot about them, and in some cases struggle to even learn their names. Ian Donnelly is a physicist and ... what else? Colonel Weber is trying to maintain order at every turn, and as an authority figure that's well and good, but he goes back and forth between being very considerate and lenient to hardened. I can't even tell you the name of Michael Stuhlbarg's character, even though he butts heads with our lead more than anyone else. We don't see much of the aliens, for the most part, as they find themselves clouded in fog and hiding behind a barrier for the majority of the movie. They've been created with great special effects, although that's helped by the obstructions put in front of them. Their designs are fine, I suppose, looking a lot like a giant human arm, from the elbow down, except instead of fingers they have tentacles. At least they're not your standard "little green men" aliens. Arrival is a very entertaining movie about learning to work together in order to avoid complete disaster. Denis Villeneuve continues to be one of the best filmmakers working at making anything thrilling - here making explanations and teachings of language far more enjoyable than any given shootout. It's thematically strong and well-acted, although its supporting characters are rather weak. 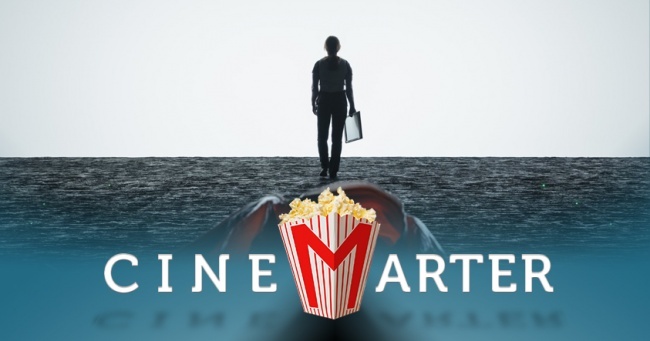 It cheats close to its finale, which may frustrate some viewers, but all in all is well worth watching and delivers thrills, themes, and things about which to think long after the credits finish their roll. 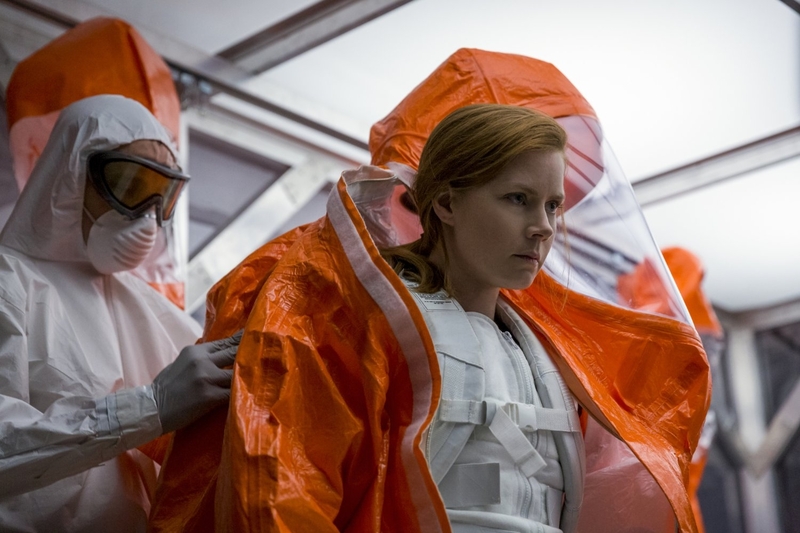 Bottom Line: While I'm not sold on a late-game change to the outing, Arrival is still a smart, thrilling movie that'll keep you engaged on an emotional and intellectual level - even after it's come to an end. Recommendation: Even with a couple of issues, Arrival is still well worth seeing.